When we set out on our Ernest Cook Trust funded Countryside Crafts Pre-apprenticeship project last year our main aim was to trial low-risk opportunities for heritage crafts businesses and young people to come together to explore the possibility of apprenticeship-style training. 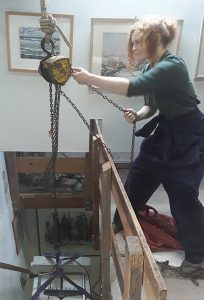 It was founded on the premise that while many heritage crafts businesses know that their long-term sustainability depends on taking on young people, when they are working hard to make ends meet then investing the time in a young person they don’t know can be a risk if there’s a chance it might not go anywhere. We are delighted therefore that not only have we had the chance to trial these kind of encounters and have written a guidance document for other organisations who wish to do similar (available here), but amazingly one of our placements has resulted in a full-time apprenticeship for Zoe Collis at Two Rivers Paper Mill on Exmoor in Somerset. We have seen the future… and it ‘s called Zoe… I’m really pleased with the way [she] is settling in. Gaining in confidence, starting to work independently and beginning to make a real contribution. We are so grateful to the Ernest Cook Trust for funding this project, without which this opportunity would never have come about, and Project Manager Tracy Hill for delivering such a good outcome. We look forward to following Zoe through her new career as a paper maker!